We caught the action on sixth street, where Brunson bet, and received two calls. Brunson bet again on seventh, and only Friedman called. Brunson turned over for a full house, and Friedman mucked. John Monnette was the bring in and Todd Brunson completed. Monnette called and check-called a bet on fourth street. Monnette bet fifth and Brunson called, leading for the two to check both sixth and seventh. Monnette tabled for a pair of tens which was good for a scoop. Adam Friedman led out with a bet on fourth, fifth, and sixth and was called by John Monnette on each street. When Friedman checked on seventh, Monnette took the opportunity to throw in one more bet. Friedman called and Monnette showed for trip eights. Friedman threw his hand into the muck and Monnette was able to scoop the pot. John Monnette completed and Todd Brunson tossed out a raise. Monnette flung a call to the middle and check-called bets on fourth and fifth. Monnette opted to bet out on sixth, only to find Brunson push out a raise. Monnette called and then check-called yet another bet on seventh. Todd Brunson was the bring in and Adam Friedman completed. Brunson called and continued to call bets on both fourth and fifth street. On sixth, Brunson took to betting and was Friedman called. Both players checked seventh and Friedman turned up to couple with the he had showing, giving him trip tens and enough to scoop the pot. The next hand Brunson completed only to find Friedman raise. Brunson called that and once again bets on fourth and fifth. Brunson led out on sixth and seventh and Friedman mucked when Brunson showed a pair of eights for the high and an eighty-six for the low. 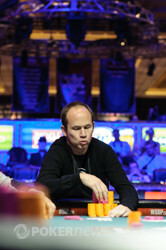 Friedman caught running jacks on fifth and sixth giving him aces and jacks, while Yakovenko failed to improve beyond his pair of nines, sending him home in 4th place. John Monnette completed and Todd Brunson pushed out a raise. Monnette called and the two players were off to fourth street. Brunson bet on fourth, fifth, sixth, and seventh, receiving a call from Monnette on each street. Brunson tabled for kings up and Monnette shook his head and threw his hand toward the muck. Scooping this pot brings Brunson over the million chip mark. We caught up with the action on fifth street, where Monnette check-called a bet. Both players checked on sixth, and Monnette led out on seventh. Yakvenko tanked for half a minute or so, but finally called. Monnette opened up . "Wow," Yakovenko said, then tried to muck. Monnette requested to see his hand, which made Yakovenko angry. "Just this time," Yakovenko told him. "Take my chips." Monnette obliged, allowing Yakovenko to muck. The next two hands, Yakovenko was all in, and chopped. The remaining four players are now on a 60-minute dinner break. John Monnette was the bring in and Nikolai Yakovenko completed to 20,000. Todd Brunson raised and both of his opponents called. Yakovenko bet on fourth and both Brunson and Monnette called. Monnette took over the aggression on fifth, pushing out a bet which Yakovenko and Brunson both called. The same happened on sixth and seventh. Monnette tabled for two pair and a seventy-six. Brunson, however, flipped up for a higher two pair, winning him the high while Monnette took the low. Yakovenko mucked his hand and watched as his opponents chopped up his money. We caught up with the action on fourth street, where Friedman check-called a bet from Arntzen. Friedman then led out on fifth, sixth and seventh, and Arntzen called all three bets. "It's time to get going," Arntzen sighed as he called on seventh. Friedman turned over for queens up, scooping the pot, and leaving Arntzen with just 5,000 in chips. There was no bring in because Arntzen was all in with the ante, and Brunson folded. Friedman completed, and only Yakovenko called. Yakovenko check-called a bet on fourth street, the two checked on fifth, and Yakovenko led out on sixth. Friedman called. Both players knuckled on seventh, and Friedman turned over for fives and fours. Yakovenko was forced to show his hand, but it was quickly mucked and we missed the contents, and Arntzen tabled for no made hand. He was eliminated in fifth place, and exited the main stage to a round of applause. John Monnette pushed out a bet on fourth street and Sven Arntzen called. Both players checked fifth, but Monnette picked up the aggression by betting sixth and seventh. Monnette flipped up for a seven-high straight and a seven low, which was enough to scoop the pot from Arntzen. 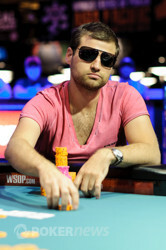 The next hand, Arntzen called bets from Adam Friedman on fourth, fifth, and sixth street. They both checked seventh and Friedman showed trip sevens. Arntzen could not beat that and had no low so he is now crippled, sitting on about 90,000. Yakovenko brought it in, Monnette completed, and Yakovenko called. On fourth street, Yakovenko check-called a bet, and the two checked on fifth and sixth. Yakovenko led out on seventh, Monnette raised, and Yakovenko went into the tank. Finally he called, and Monnette tabled . It was ace-high and a seventy-six low, and when Yakovenko tabled , he was awarded half of the pot for his pair of nines. Adam Friedman brought in and Sven Arntzen raised. 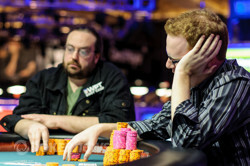 John Monnette pushed out a three-bet and Friedman folded his hand. Arntzen called and the two players were off to fourth street. Monnette bet out on fourth, fifth, sixth, and seventh and received calls each time. 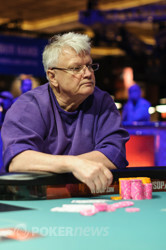 Arntzen tabled for a pair of deuces and a seventy-five, but Monnette was able to grab the low with for a sixty-five. Friedman brought it in, Monnette completed, and Yakovenko called. Friedman called as well. On fourth street, Monnette bet out, and only Friedman called. Friedman called another bet on fifth, and both players checked on sixth. Monnette checked again on seventh, and Friedman tanked a bit before betting. "Every decision is a big one," Friedman quickly returned. Monnette eventually mucked, and Friedman added to his stack. Todd Brunson bet out on fourth street and received three callers in the form of Zimnan Ziyard, Sven Arntzen, and John Monnette. All three players checked fifth and on sixth Brunson bet out again. Ziyard raised and Monnette and Arntzen both folded. Brunson three-bet and Ziyard four-bet all in. After the seventh street deal, Brunson tabled for a straight and Ziyard mucked his hand, making his our sixth place finisher. 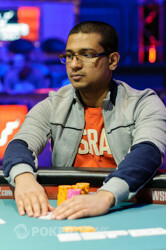 Ziyard will earn $44,967 for his efforts.